During one of history's darkest chapters, one man is determined to make a difference. Summoned from his South African post to return to Nazi Germany, Kolbe leaves behind his beloved fourteen-year-old daughter, a decision made for her safety that nonetheless torments him. And as he lives under the constant threat of arrest, he wrestles with the guilt of putting Marlene Wiese, a married nurse and the love of his life, in danger as they collaborate on Kolbe's clandestine work. But no matter the personal cost, Kolbe will not be deterred. In scenes that pulse with suspense, he emerges as a towering figure who risked everything to save innocent lives - and Germany from itself. ...spy Fritz Kolbe (AKA George Wood). Kolbe was an employee of the Germany Foreign Office in Berlin who was the most important spy for the allies in WWII. The story is fictionalized to a relatively small degree and it is dramatized with detail that is uncertain. Spy stories are fascinating because they reflect how brave and useful a spy can be. 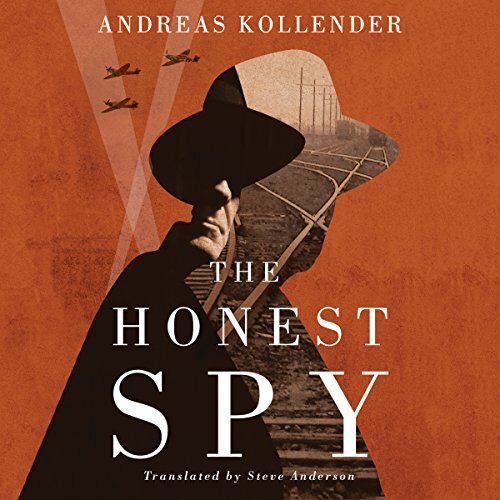 Fritz Kolbe's story as a WWII spy for the Allies can never be fully verified because of the inherent nature of secrecy needed to become a successful spy. The book shows the more human side of Kolbe with the inclusion of Kolbes love for his daughter and paramour. Well written and encourages further reading about other unsung WWII heroes. 65 sur 75 personne(s) ont trouvé cet avis utile. I've now done some reading about the real Fritz Kolbe and his story is fascinating. Somehow Kollender gets mired in the telling and it became very tedious listening. I'm an avid audio book listener and for one of the very few times in years I did not finish novel. Would you ever listen to anything by Andreas Kollender and Steve Anderson - translator again? He was fine. The problem is in the story/writing. Story is based on a very interesting man about whom I had no idea. I wanted a book about the spying. A little love story in the mix is not bad but this is a love story about a spy. 59 sur 71 personne(s) ont trouvé cet avis utile. My goodness. I have not been this captivated by a story in a very long time. More... More... Give me more . Well written. An amazing story. I highly recommend this book. I was drawn right into this in a way that doesn't always happen, but is always enjoyable. It looks like some of the events of his life were streamlined or left out, which is inevitable, but it made it a very good story, so it was worth it. You live with the characters and have a very vivid sense of what it was like to be in Berlin during the war. I see there is a more comprehensive biography of his life, A Spy at the Heart of the Third Reich, but this one stands alone as a non-fiction book with the intensity of a good spy novel. 12 sur 17 personne(s) ont trouvé cet avis utile. I loved the blend of history, suspense, and romance that made up this book. I would definitely recommend it! This story meshes with stories I've Heard from old friends who lived through the bombing of Berlin and escaped to the West, to the Americans.